When cold and flu season comes along, chronic allergy sufferers might be inclined to shrug their shoulders and say, “What’s the difference? I can’t breathe well half the year anyway.” Yet winter cold and flu prevention is possible for allergy sufferers who learn how to build germ and virus protection into their home and work environments. We all know the symptoms of allergies can be miserable business, with sore, itchy eyes, congested nose and throat, sluggish behavior and even an emotional depression can set in when you can’t find relief. Throw the risks of cold and flu season on top of an already stressed body and mind, and you can be facing troubles you’d rather not face. That is why allergy sufferers need to take basic (yet sometimes bold!) precautions when the seasons for cold and flu come around. The Zadro UV Toothbrush Disinfectant Scanner helps prevent the spread of colds and flu by using UV light to kill whatever viruses and bacteria remain on your toothbrush after brushing and rinsing. It works quickly in five minutes and fits neatly over your toothbrush. 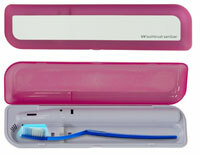 Plus, the case for the UV light is so streamlined it can double duty as your toothbrush travel case. Sinus irrigation to treat colds and nasal irritations such as sinus drip is one of the oldest remedies for nasal health in the books, recommended by homeopathic doctors going way back to the prairie settlement days. But we’re here to tell you that nasal irrigation has come a long way since the advice of simply shooting a salt-based solution up your nose. The SinuPulse Elite is a nasal irrigator that helps your nose do its job better by irrigating with a pulsing movement that stimulates the sinus cilia. That process helps clear allergens and maintains health nasal resistance against viruses and other unwanted invaders. Ongoing clinical studies have shown that pulsating irrigation can be 100 X more effective than non-pulsing irrigation. But the most important aspect of the SinuPulse Elite is the comfort it affords the user. You can adjust pulse rate for cleansing as well as soothing. If you have never tried nasal irrigation you may be pleasantly surprised how the Health Solutions SinuPluse Elite can treat cold and allergy systems and make your nose a better way to breathe! Airborne allergens and germs don’t stand a chance when you break out the GermGuardian 3 in 1 Air Cleaning System, featuring UV-C Technology for killing flu, strep and common cold virus and bacteria. This air cleaner and purifier also offers True HEPA Filtration to capture 99.97% of airborne allergens including pet dander, mold spores, pollen, household dust, etc. The three-stage filtration system with UV-C technology kills germs including H5N1, flu virus and SARS while filtering the air. The GermGuardian also prevents mold growth and delivers odor control thanks to its Activated Carbon Charcoal Pre-Filter. Treats 210 square feet of living space. This unit weighs 12 lbs and stands 28"H x 7"W x 12"D. There is a three-year factory warranty. The Verilux UV-C Mini Sanitizing Wand helps you go after germs wherever they might occur, from door handles to sink and bathroom counters where germs and viruses are known to populate. With the capacity to eliminate 99% of bacteria and viruses, this mini-sanitizing wand is a germ and odor-killing tool that can give you peace of mind and protect your health. The 10.4" long, 1/3 lb. sanitizing wand even kills bed bugs and dust mites using the same UV-C technology hospitals trust to sanitize everything from contact surfaces to bedding and instruments. That can keep you and your family healthy and free from risky germs and even devastating disease. And that’s worth the wave the Verilux UV-C Mini-Sanitizing Wand, now isn’t it? 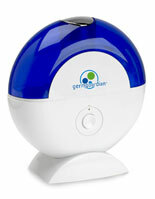 One of the worst enemies of allergy sufferers and people susceptible to colds is the risk of really dry air which is especially common in environments where forced air heating can dry sinuses, which is why the Personal Ultrasonic Cool Mist Humidifier by Germ Guardian is such a vital tool to keeping air moist so that your sinuses don’t take a beating. Enjoy the feel of clean, fresh water vaporized into the air. The Nano-Silver technology in the Cool Mist Humidifier kills a wide variety of bacteria and viruses, always ensuring that mold and bacteria will not grow in the water tank. Tiny (one-billionth of a meter) silver particles kill bacteria, viruses and mold on contact. This unit runs near silently and stands only 9” tall by 8” wide by 4” deep. It is low maintenance with no pads, wicks or filters to clean or replace. Clean by simply wiping the tank and base periodically. The tank holds half a gallon and the Personal Ultrasonic Cool Mist Humidifier covers 210 square feet. Runs for 10 hours…long enough for a great night’s sleep! Comes with a 3-year manufacturer’s warranty. Allergy Asthma Technology is dedicated to providing products that deliver an allergy free environment in your home or workplace. We figured you’d like to know the many ways our products can help you avoid winter colds and flu so that you can enjoy life along with others around you.